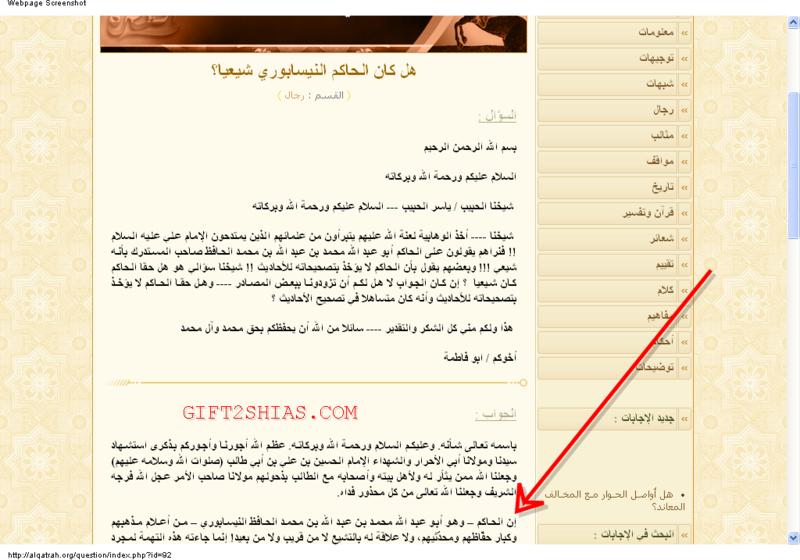 Let us quote polular shia dog Yasir al-Habib answer to the claim of Abdulhusayn that Sherik was shia. HE WASN’T SHIA, BUT HE WAS NASIBI KHABITH! 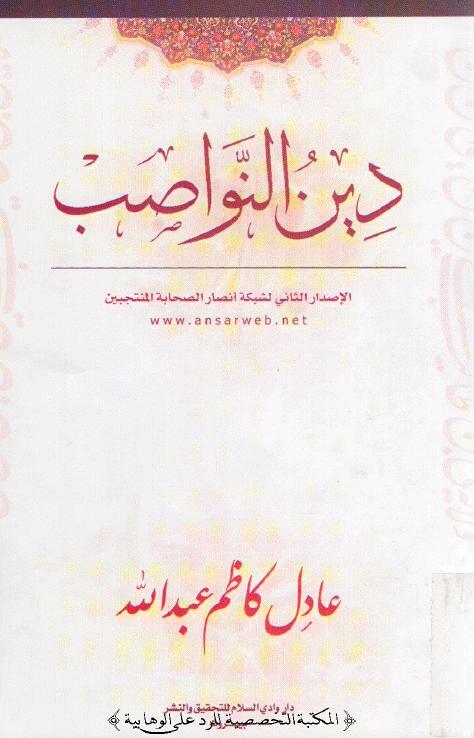 Shaykh of rafida Abdulhusayn al-Musawi filled his book “al-Murajiat” with all kinds of outrageous lies and distortions. 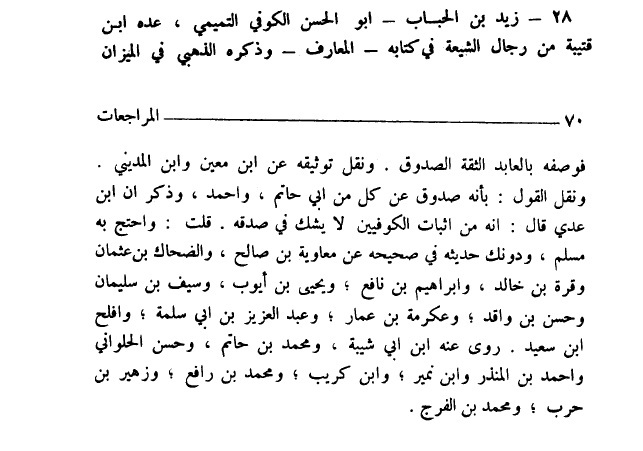 In his famous letter, which we have discussed in the details, he ascribed a lot of known people to the shia sect. Amongst them was Hakim Naysaburi (rahimahullah). 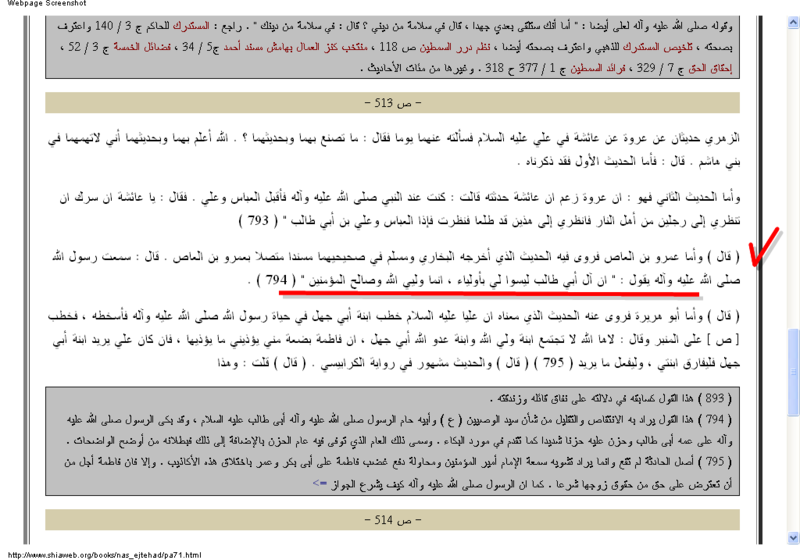 Let us quote polular shia dog Yasir al-Habib answer to the claim of Abdulhusayn that Hakim was shia. إن الحاكم – وهو أبو عبد الله محمد بن عبد الله بن محمد الحافظ النيسابوري – من أعلام مذهبهم وكبار حفّاظهم ومحدّثيهم، ولا علاقة له بالتشيع لا من قريب ولا من بعيد! 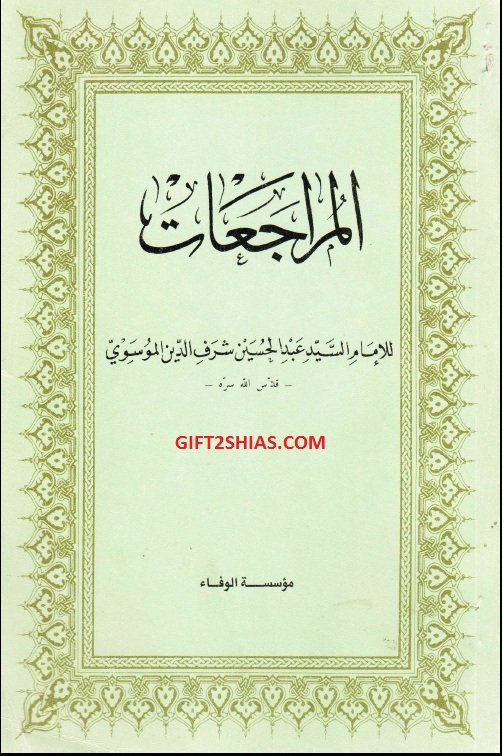 Hakim – he is Abu Abdullah Muhammad ibn Abdullah ibn Muhammad al-Hafidh an-Naysaburi – from their scholars of their (sunnis) mazhab, from their greatest huffaz and their hadith masters, THERE IS NO TIES BETWEEN HIM AND TASHAYU NOT FROM THE CLOSE NOR FROM THE FAR AWAY. 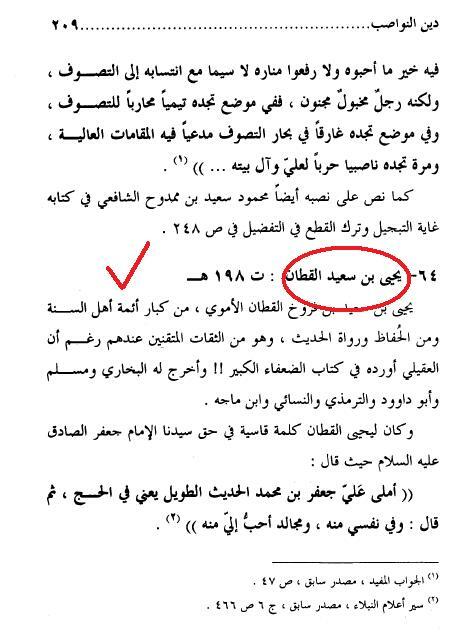 Noticed one interesting point in book “al-Murajiat” (Muasasat Wafa). And want to share with muslims. Indeed about such people like Abdulhussain it was said: He is more misguided than his domestic donkey. 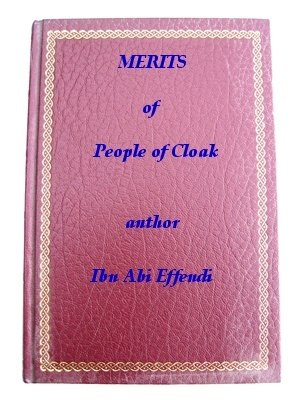 Ibn Qutaybah has included his biography among those whose biographies he has included among Shi`a dignitaries in his work Al-Ma`arif. 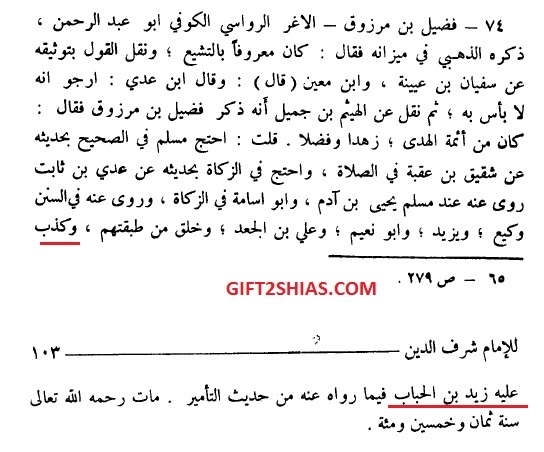 Al-Thahbi has mentioned him in his Al-Mizan describing him as “pious trustworthy truthful.” He indicates his being vouched as trustworthy by Ibn Ma`in and Ibn al-Madini. 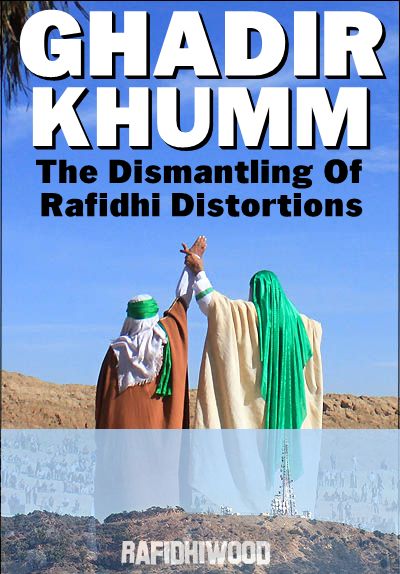 He has quoted Abu Hatim and Ahmed describing him as truthful adding that `Adi has said: “He is one of the reliable Kufi traditionists whose trustworthiness is never doubted.” Muslim has relied on his authority. Refer to the latter’s sahih containing his hadith as narrated by Mu`awiyah ibn Salih al-Dahhak ibn `Uthman Qurrah ibn Khalid Ibrahim ibn Nafi` Yahya ibn Ayyub Saif ibn Sulayman Hasan ibn Waqid `Ikrimah ibn `Ammar `Abdul-`Aziz ibn Abu Salma and `Aflah ibn Sa`id. His hadith is quoted by Ibn Abu Shaybah Muhammad ibn Hatim Hasan al-Hulwani Ahmed ibn al-Munthir Ibn Namir Ibn Karib Muhammad ibn Rafi` Zuhair ibn Harb and Muhammad ibn al-Faraj. 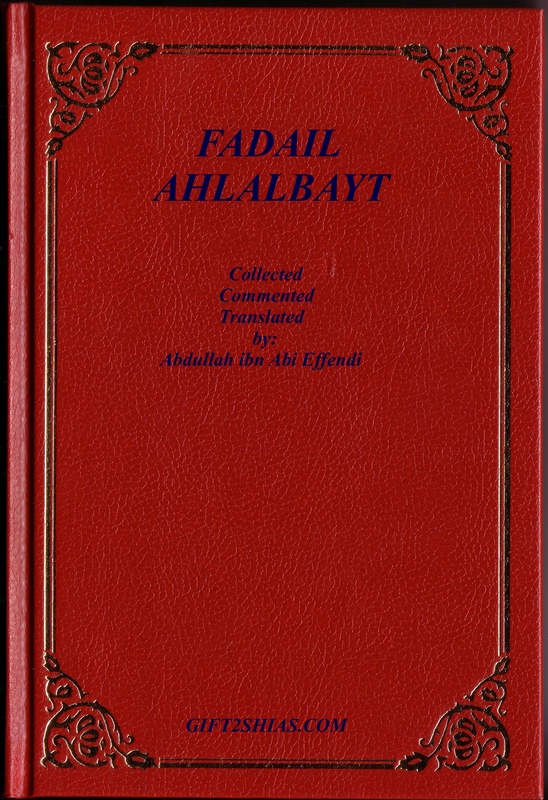 In his Sahih Muslim relies on the authority of Fadil’s ahadith which deals with prayers as transmitted by Shaqiq ibn `Uqbah and with zakat by `Adi ibn Thabit. His hadith dealing with zakat as recorded by Muslim is transmitted by Yahya ibn Adam and Abu Usamah. 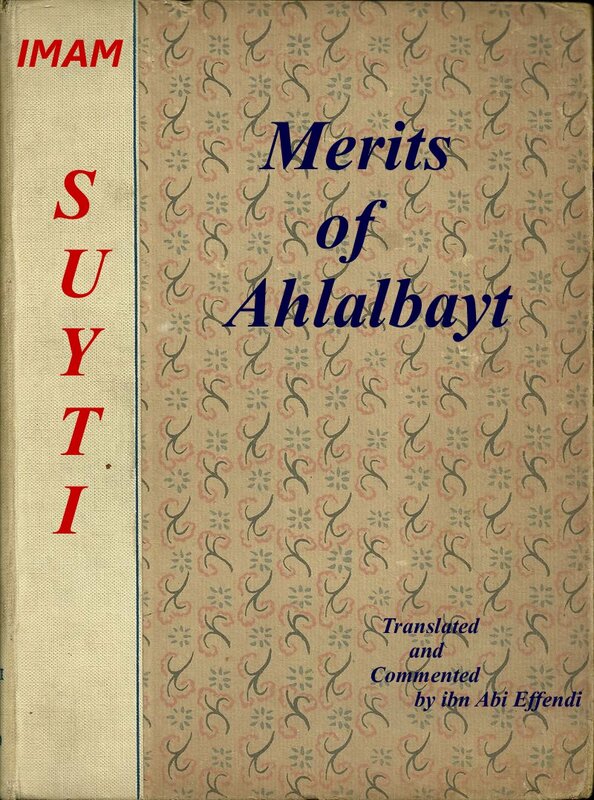 In the sunan his hadith is quoted by Waki` Yazid Abu Na`im `Ali ibn al-Ja`d and many peers. Zayd ibn al-Habab has in fact lied regarding what he attributed to him of hadith dealing with the appointment of `Ali (a.s.) as Amr by the Prophet (p.b.u.h.). He died may Allah have mercy on him in 158. So as real hypocrite and liar, this Abdulhussain praises Zayd ibn al-Habab when it suitable to him, but when he sees something from him which contradicts his rafidi beliefs, he accuse him in lie. What else can we do expect laugh at this ignorant liar al-Musawi? And it was narrated by Muslim in his book “al-Eman” from his Sahih: and it is tawatur saying of prophet (sallalahu alaihi wa ala alihi): Whom I am mawla Ali is his Mawla, O Allah befriend to those who would befriend him and enemy to those who would be enemy for him”. One question. Where is this hadith in Muslim? May be its version of Muslim which was printed in the “Holy” city al-Qum? Because I couldn’t locate this hadith in mentioned place. As for Amr ibn al-As, he narrated about this hadith which was transmitted by Bukhari and Muslim in their Sahihs with connected chain till Amr ibn al-As, which said: I heard prophet (sallalahu alaihi wa alihi) said: “The family of Abu Talib are not closer to me, indeed my wali is Allah and other believer”. 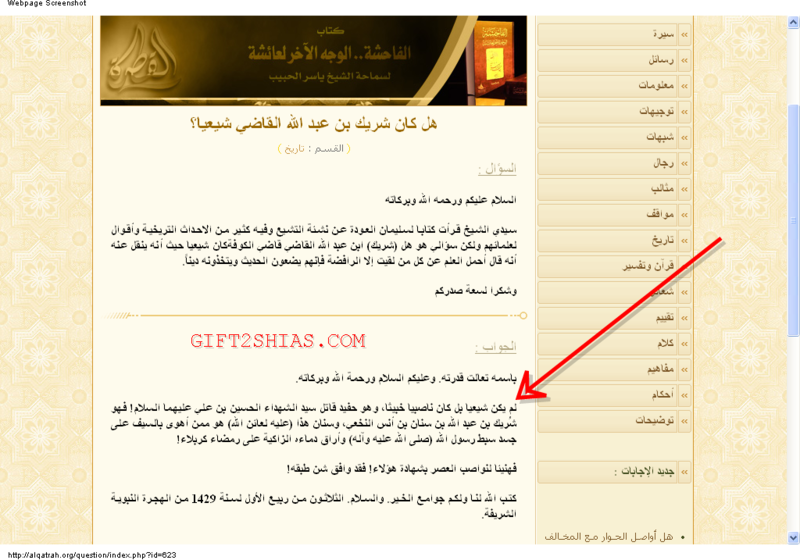 1) I couldn’t find hadith with mentioned text in Bukhari. 2) In Muslim it came in different form than this slave of Husayn mentioned. ‘Amr b. ‘As reported: I heard it from the Messenger of Allah (may peace be upon him) quite audibly and not secretly: Behold! the posterity of my fathers, that is, so and so, are not my friends. Verily Allah and the pious believers are my friends. If it had been from other than Allah, they would have found many inconsistencies in it. Shia known and famous pop-star Abdulhusayn al-Musawi al-Kadhab in his famous shia book “al-Murajiat” listed 100 names of narrators, which were allegedly shias, which were relied upon by Islamic scholars. We have answered to that letter in details. 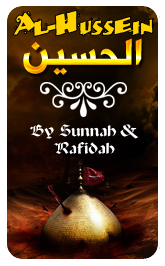 Among many people, Slave of Husayn mentioned imam Yahya ibn Saeed al-Qattan, as if he was shia. (See #95, in that letter). However other shia author Adil Kamal Abdullah in the book “Dinu an-Nawaseeb” included imam Yahya ibn Saeed al-Qattan among nawaseeb! So ya rafidah! Was imam al-Qattan faithful shia or nawaseeb?!!! Allah was afraid of someone’s harm? I personally have a nice and more precise point. When the Almighty applied the plural rather than the singular form as many do then those who hated `Ali as well as all those who were envious of and in competition with Banu Hashim would not be able to tolerate hearing it in the singular form for they would then be unable to hide the truth or water it down. Because of their desperation they might even do something quite harmful to Islam. It is quite possible that it was for this reason that the verse was revealed in the plural form though applied to the singular: in order to avoid the harm resulting from disgracing those folks.